Well, we’re getting used to living on the boat. Todd has a system whereby he hits the shower in the morning, then leaves his towel, dopp kit and boat slippers in the car; then when he comes home, he gets those things back out of the car, and leaves his work shoes. He hits the bathroom to brush his teeth, then comes back to the boat. We’re both using the car as a sort of staging area. I’m really enjoying working and hanging out on the boat. We have wireless internet access, so I sit below, listen to KFOG, and crank out test cases. When I need a break, I do little tasks on the boat, like washing down the decks with salt water. Sequoia has only spent two nights with us so far. The first was a bit rough- she got to bed late and was up in the middle of the night. The second went better. Once Todd left in the morning, she came into the main berth with me, and slept until 9:15! Check out the album of our first couple weeks! It includes pics of Todd going up to the top of the mast, an egret, a heron, and… THE SEAL! I’ve been trying to get a shot of him since day 1! We’ve moved onto the boat! 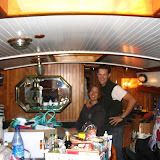 This past weekend, we took an important step: we moved out of our house and onto the boat! We kept one very small bedroom of our apartment, into which we put all of our furniture and things that won’t be setting sail with us. We took 4 days (Friday – Monday) to pack up, thoroughly clean, and move. It was enough time that although busy, we never felt rushed or overwhelmed by the work. Click the image to see a bunch of pics from our move. Emotionally, it was hard to leave 68 Douglass, because it has been such a great place to live! It was almost exactly 3 years ago that we initially moved to Douglass, and those have been 3 fantastic years! We will miss our comfortable home, the neighborhood, and having great friends living right upstairs. We also said (temporary) goodbyes to Komodio (our lizard, a bearded dragon), and Flame and Spot (our goldfish). Komodio will be living with Sequoia’s good friends the Herbertsons in Ukiah, while the fish will live with Kelly and Zai on 16th St in SF. Although it is probably one of the easier challenges we’ll face, moving to the boat seemed like a big hurdle. Now that we’re here and getting settled, the trip seems so much more real, and immediate. We have two months to finish our preparations. 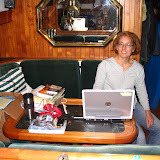 You are currently browsing the Susan, Sequoia, and Todd go sailing blog archives for August, 2007.